ST. LOUIS (AP) — It took 14 pitches before Jack Flaherty finally got Justin Turner to ground into a double play that ended the first inning Wednesday night. Flaherty didn’t think such an early tussle was all that important to his entire outing, but his manager begged to differ. 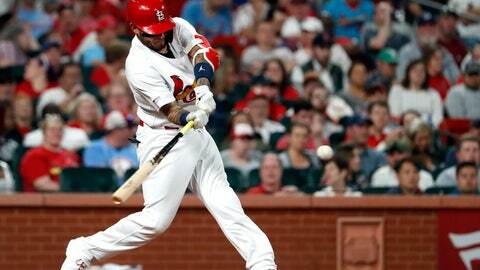 Yadier Molina and Marcell Ozuna homered, and Flaherty tossed six effective innings to help the Cardinals win their fourth in a row. They’ve outscored their opponents 19-6 during the winning streak and will go for a four-game sweep of Los Angeles on Thursday. His day started with a 23-pitch first inning that ended with the double play. He looked to the sky and breathed a sigh of relief after retiring Turner. Turner, who fouled off five consecutive 3-2 offerings, hit the ball right to DeJong at shortstop for an easy double play. The home run served as a bit of redemption for Ozuna, who fell face-first on the warning track after climbing the left field fence while trying to make a catch Tuesday. “When you make a mistake, you’ve got to do better the next day,” Ozuna said. Pederson’s one-out homer in the sixth brought the Dodgers to 2-1. Los Angeles has gone deep in 11 of 13 games this season. Dodgers ace Clayton Kershaw is scheduled to make his season debut Sunday or Monday, according to Roberts. Cardinals: Ozuna was in the starting lineup after he tumbled off the outfield fence Tuesday when a long drive came up short of the wall.